Reviewers were quick to hail the collection as hilarious and ingenius, but I have my serious doubts. As a rule, I'm always skeptical when fashion tries to do "thought-provoking" forays into working class fashion. At best, it's unoriginal; at worst, it's remarkably classist and offensive (recalling that infamous Vogue Italia shoot, Scott has designed a tongue-in-cheek high fashion do-rag, which several models sported. Sigh). To me, the worst part of this line is the fact that there's a look that's based on a McDonald's uniform. It's in pretty poor taste to make a thousand-plus dollar dress that's "cheekily" inspired by the uniform of someone who barely makes a living wage. Moschino dresses typically sell for up to $2,000, and a sweater from the collection is already retailing for $780. The average McDonald's worker makes $1,105 a month. 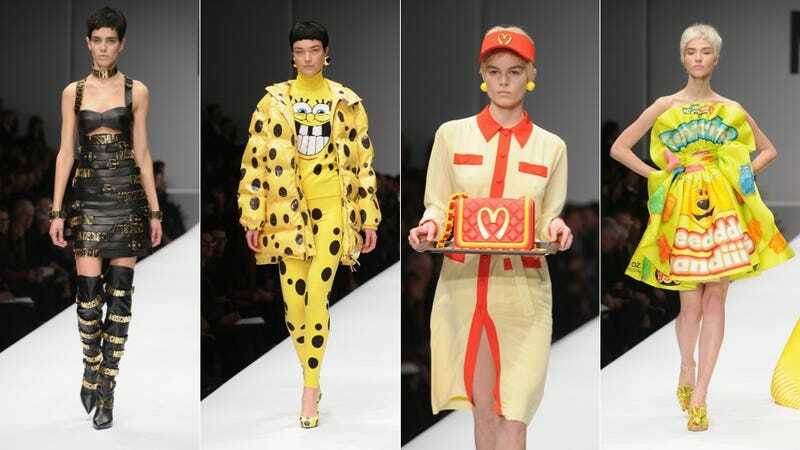 Perhaps Scott thinks he's lampooning fashion's obsession with brand recognition or calling into question the notion of "good taste," a la Franco Moschino. But the fact that there doesn't seem to be any real social commentary in the look— just a desultory, attention-seeking dig at the fashion industry — is gross.